I thought that one might come from Thomas Byrom’s kinda-made-up “translation” of the Dhammapada, or from Jack Kornfield’s “Buddha’s Little Instruction Book.” It turns out it’s a bit of both. Byrom’s version is actually pretty accurate by his standards. A lot of the time he just wrote his own poetry, more or less ignoring what the Pali text actually says. The imagery almost certainly comes from another text altogether: the Mahayana Diamond Sutra. So it’s an interesting conglomeration, this one! It embodies things the Buddha said (and even though the Diamond Sutra was composed long after the Buddha’s death, the concluding verse is similar to some things he’s recorded in the Pali scriptures as having taught). But despite these similarities, “Your days pass like rainbows, like a flash of lightening, like a star at dawn. Your life is short. How can you quarrel?” is definitely not a direct quotation. Sounds suspect to me. 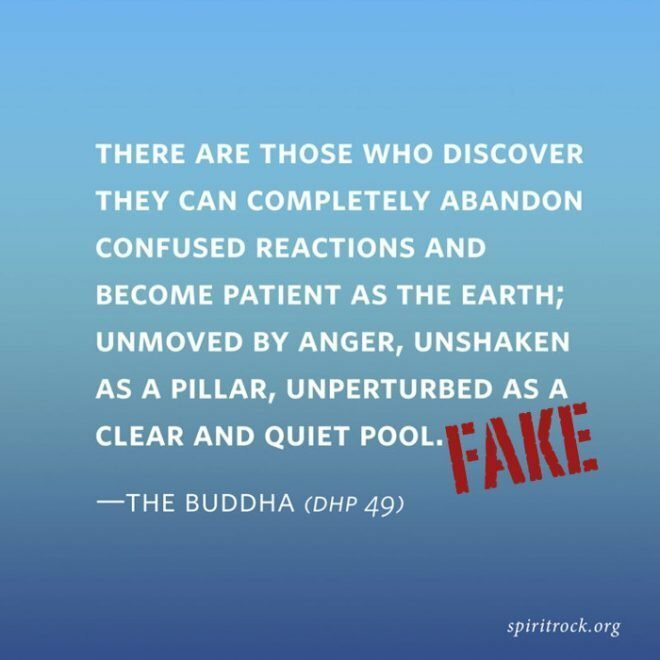 So many of these fake quotes going around make the Buddha sound like a 2,500-year-old version of Oprah. The Buddha’s philosophy merits more than being reduced to feel-good, new-age, fortune-cookie philosophy. Anyway, I’ve been an armchair Buddhist for about a decade, and I’ve never run across this quote in my studies. I think Adrian was right to be suspicious. I’m 99.9% sure this isn’t a canonical quote, and that at best it’s a paraphrase. According to Frank MacHovec’s 2007 book, Buddha, Tao, Zen, “Be mindful of the kindnesses and not the faults of others” (note the absence of “always” and the use of “kindnesses” rather than “kindness”) was a saying of Master Chin Kung of the Amida Society. Do not focus on the rudeness of others, what they do or leave undone. Focus instead of what you have done and left undone. How the specific version “Always be mindful of the kindness and not the faults of others,” with its addition of “always” and the change from “kindnesses” to “kindness” came to be, I can’t say. 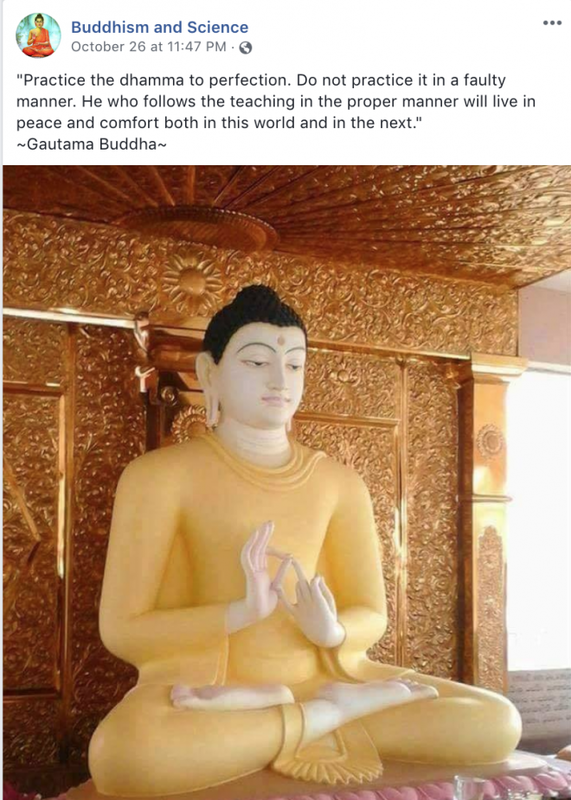 It’s in a book of “Buddha Quotes” (many, if not most of which are fake), but the book was published in 2013, and since Google says there are 25,000 instances of the quote on the web, the saying must have been around for a while. He said he’d seen it silk-screened on a tapestry in Asheville, NC. It’s a rather odd, and slighly inaccurate, translation of the 365th verse of the Dhammapada. I’m rating this one as “Fakeish” rather than “Fake” because it’s simple a case of bad translation. One should not despise what one has received, nor envy the gains of others. The monk who envies the gains of others does not attain to meditative absorption. don’t go coveting those of others. For some reason the translator has taken “na atimabbeyya” (one should not despise, slight, or neglect) to mean “one should not overrate,” thus reversing the meaning of the original. I don’t know who the translator was, but the earliest instance of this quote that Ive found on Google Books is in a 1956 book called “The Wisdom of the Living Religions,” by Joseph Gaer. Unfortunately Google Books doesn’t let me look inside the book, even to see a snippet.